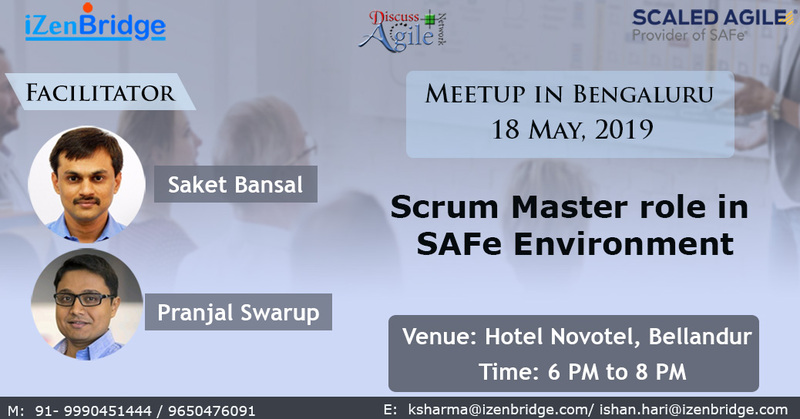 Get a glimpse of the role of a Scrum Masters in a SAFe Environment and how SAFe Scrum Master (SSM) certification signifies that people are prepared to perform the role of Scrum Master in a SAFe environment, increasing their value to teams and organizations that are implementing SAFe. The objective of this session is to enhance ones career potential with additional skills. 1. When an organization needs SAFe Scrum Master? 2. How does the Scaled Agile Framework work? 3. What are all roles of SAFe Scrum Master? 4. How can one learn more about SAFe? 5. How can one get certified in SAFe Scrum Master? 6. How to implement DevOps in Scaled Agile Framework (SAFe)? During this meetup, also get a glimpse of DevOps. Attendees will earn 2 SEUs and 2 PDUs.